I read William Riviere’s By the Grand Canal (Grove Press, reprinted 2005) a few months ago, and I enjoyed his detailed, atmospheric and loving descriptions of Venice. 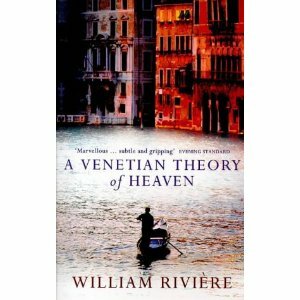 Just before Christmas, I managed to track down a copy of A Venetian Theory of Heaven. The novel follows Venetian-born heiress, Amedea Lezze. Married to English architect Guy Ashmanhaugh, and mother to their young son Corrado, Amedea is restless and bored with the domesticity of her life. She meets a newly arrived French lecturer, Gerard Charry, and finds a means of escape. Amedea leaves her family in Venice and rents an idyll in Tuscany which she shares with Gerard. And yet, even with him she is restless, and in pursuit of occupation and diversion, Amedea remembers her father’s theory of heaven and sets off on small trips around Europe in search of ‘lost’ Venetian paintings. I am entranced by this ‘Venetian theory of heaven’, and Riviere’s descriptions of Amedea’s travels in search of the paintings set me off on my own detective hunt over the past few days. What does Giorgione’s Sleeping Venus look like? Where is it? Which pictures did the French steal? Where is the ceiling in London?